Tangalooma is located on Moreton Island, a huge sand island just off Brisbane. 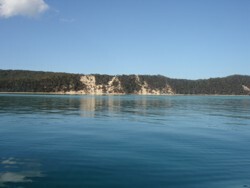 The photo above shows some of the sandcliffs just along from where the boat jetty is at Tangalooma Island Resort. There are many different types of one day tours and cruises to Tangalooma and Moreton Island in Moreton Bay. On this page I have tried to cover as many of the options as I can including suggestions as to which are suitable for different needs. Booking ahead is really important because all these Tangalooma one day tours have limited spots and they do get full at peak holiday times. There are so many variations and options, so I am going to direct you to my suggestions, or you can sift through the list yourself of tours that go to Tangalooma, cruises in Moreton Bay and trips to Moreton Island. Gold Coast Hotels To Tangalooma Door To Door One Day Adventure No need to worry about transfers or driving yourself. Let the coach pick you up from your hotel in the morning to deliver you to the wharf ready to board the ferry across to the resort on Moreton Island. Spend a full day on the island with the option to stay late for the Wild Dolphin Feeding. Enjoy the resort facilities for the day or add in extra activities. This is a long full day, but well worth it. This is my top recommendation for those staying in Gold Coast, but not hiring a car, or wanting to drive. Sit back and enjoy this tour without the stress of driving or getting to the wharf on time! Check out the Dolphin Feeding Adventure Tour for more options. Make Your Own Way To Tangalooma Cruise Terminal In Brisbane. This is a drive yourself option. You will need to make your way to Holt Street Wharf in Brisbane, at Pinkemba near the Airport. From the wharf you will take the ferry across to the resort on Moreton Island - these ferries only go at certain times, and it takes an hour plus to get to the resort. Once there you can enjoy the resort facilities for the day including many free activities as well as optional extra activities you can pay for. There is also an option to stay on for dolphin feeding and return on the last launch on the Dolphin Feeding Adventure Tour. Adventure Activities on Moreton Island start with the transfer over to the island on the Tangalooma Luxury Catamaran. Choose from a range of activities on the island. Departs from Holt Street Wharf, will need to make your way there or transfers available from Brisbane Hotels. Other tour operators include Dolphin Wild Cruises who also visit Tangalooma Wrecks for snorkelling, lunch on board boat, and much more. Departs from Redcliffe in Brisbane. Redcliffe is a significantly further drive from the Gold Coast than the Holt Street Wharf, so this tour is not so appealing for those staying in the Gold Coast due to the extra travelling. It is great for those staying in Brisbane. Moreton Bay ferry departs from Newport Marina, Scarborough (northern Brisbane) and takes 2 hours to get to Bulwer on Moreton Island. Please note this does not take you to Tangalooma Island Resort. And this is once again, a significant drive from the Gold Coast. Moreton Bay Dive trips and Eco Tours are offered by Reality Cruises which includes a range of dive trips including live on board options as well as day trip experiences and eco tours. These tours generally run between September and May each year. Check terms and conditions for each tour. You may be able to change the dates, subject to availability etc. Please do check that, don't take my word for it, as these things have a habit of changing! Here is a list of things to take if your one day tour to Tangalooma or on a cruise. Some are optional, others are a must! Swim wear, towel and snorkel if you have one. I think you can hire snorkels at Tangalooma Island Resort if you are going there.